Nutrition spans a wide range of mechanisms from acquisition of food to digestion, absorption and retention of energy substrates, water and other nutrients. Nutritional principles have been applied to improving individual health, athletic performance and longevity of humans and of their companion animals, and to maximizing agricultural efficiency by manipulating reproduction or growth of tissues such as muscle, hair or milk in livestock. Comparative nutrition borrows from these tra- tional approaches by applying similar techniques to studies of ecology and physiology of wildlife. Comparative approaches to nutrition integrate several levels of organization because the acquisition and flow of energy and nutrients connect individuals to populations, populations to communities, and communities to ecosystems. Integrative Wildlife Nutrition connects behavioral, morphological and biochemical traits of animals to the life history of species and thus the dynamics of populations. An integrated approach to nutrition provides a practical framework for understanding the interactions between food resources and wildlife popu- tions and for managing the harvest of abundant species and the conservation of threatened populations. This book is for students and professionals in animal physiology and ecology, conservation biology and wildlife management. It is based on our lectures, dem- strations and practical classes taught in the USA, Canada and Australia over the last three decades. 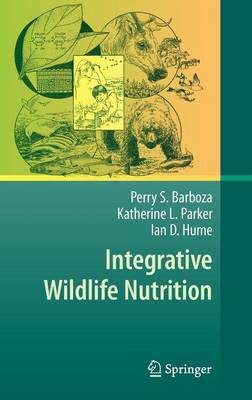 Instructors can use Integrative Wildlife Nutrition as a text in wildlife and conservation biology programs, and as a reference source for related courses in wildlife ecology.